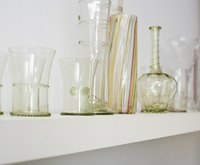 Glass vases are great because they're widely available at craft stores and quite inexpensive. However, they're sometimes plain and boring. Dress up a glass vase with decoupage. It's a fun and quick way to personalize a gift (especially if you're giving a bouquet to a hostess) or to create a vase that will match your decor. You can use whatever type of paper image appeals to you, whether it's a paper napkin rose, an interesting magazine image or a photocopy from a book. Clean the vase's exterior with rubbing alcohol and cotton balls. This will take off the oils from your hands and any other extraneous residue. Decide where to position your paper image (or images). Apply Mod Podge to the back of the image with a foam brush and press the image against the glass. Apply several coats of Mod Podge over the vase, letting each one dry. This seals the paper and makes it adhere. Use accent acrylic paints in the color of your choosing. Yes, you'll be applying the paint over the dry coat of Mod Podge; this will make the paint stick better. Allow the paint to dry, then apply one more coat of Mod Podge over the vase exterior to seal the paint. You can apply the decoupage to the interior of the vase instead if you can fit your hands inside the vase's mouth. Follow the same steps. However, it will not be water safe, so insert a glass into your vase for flowers. Cut out intricate images with a craft knife instead of scissors.